Summer is coming to an end and autumn will be upon us soon enough – and this is a time of the year when some people will be looking to squeeze in another holiday before the year finishes. Traditional beach breaks, though, may not appeal, so here www.cumbrian-cottages.co.uk has compiled a list of three autumn getaways with a difference. Fans of outdoor pursuits will be spoilt for choice if they decamp in the Lake District for a few days or longer. Here you can walk, hike, climb, swim, abseil, row, bike and pretty much do anything else you can imagine in the great outdoors. And all against the backdrop of some the most breath-taking scenery in the whole of Europe. When it comes to finding accommodation Windermere and the surrounding towns and villages have plenty to offer. Summers in Vegas are ridiculously hot, so if you’re ever thinking about visiting ‘Sin City’ then autumn is an ideal time as temperatures are slightly cooler. Everybody should take in the Vegas experience at least once in their lives – it more than lives up to the hype. There’s more to Vegas, though, than having a flutter in one of the many casinos. Catch a show, enjoy a spot of retail therapy or visit nearby Hoover Dam or the Grand Canyon. For an alternative city break, check out Munich from September 21 to October 6. That’s because these are the dates on which this year’s Oktoberfest takes place. 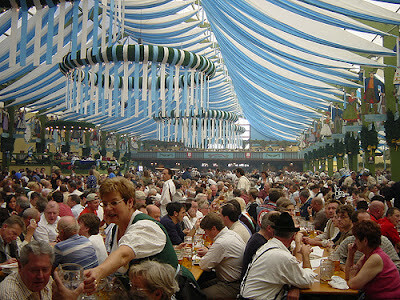 Oktoberfest, for those who don’t know, is a huge beer festival that attracts around five million visitors annually. If you can prise yourself way from the amazing food and drink, Munich city centre has plenty of other things to keep culture vultures happy. All are excellent getaways from a serene lakeside tour in England to the scenic Grand Canyon and the festive Octoberfest in Germany. I hope this time I can go to Munich and experience the Oktoberfest! I just hope I could visit these places in the future most especially Munich which is one of the largest cities in Germany. The Grand Canyon always looks... well, grand! But I miss the Lake District. I can never have enough of its beauty. Those are fantastic travel destinations! I hope I have deep pockets so I could visit them one day! Looks like Munich in Germany is so much fun than the rest of them.